White marble floors are a dream come true. They give a crisp, immaculate, and luxurious look to any home. White spaces make any space look bigger and more spacious, and when it's combined with marble, it gives a gleaming, gorgeous look to any home. Unfortunately, this Longmont homeowner's radiant white marble floor had severe orange stains and a dull look. It was nothing like the glossy sheen it had years ago. She tried a few recipes she found on the web to restore her marble floor, but nothing seemed to work. She knew she had to put the stone floor in the hands of professionals, since replacing the marble tiles was just not something she wished for. She decided to look for Longmont stone cleaning. 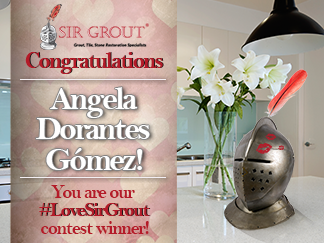 She found Sir Grout Denver among the first results and was impressed by their TrustDale Certification and decided to give them a call. White marble has a small percentage of iron, and when it is exposed to large quantities of water, acids, or bleach, the marble will begin to oxidize and rust. In extreme cases, the marble can turn to a dark orange color akin to what happens when you leave iron out in the rain for an extended period of time. When you see dark orange lines in your marble, the culprit is the iron composition in the marble and exposure to water or harsh chemicals. These rust lines are somewhat difficult to eliminate, since they form in the interior of the stone. You can see from the picture above that this was the homeowner's problem. She had rust stains on her white marble floor. In ten years, she had only put her marble floor in the hands of experts once. The rest of the cleaning was done by herself with cleaning products you can find at any store. The problem with those cleaning agents is that they are not suited for marble. Most of those cleaning agents are acidic-based cleaners that will harm any stone. Our Sir Grout of Greater Longmont stone sealing specialists arrived at the homeowner's house, talked with the customer, and performed an inspection of the floor. After seeing the floor, they found that the orange stains were rust stains that were in the interior of the stone. The job was a big challenge that Sir Grout's specialists were willing to take. Most stone specialists would recommend replacing the floor, but not Sir Grout's team. They love big challenges, so eliminating the orange rust from the white marble floor and returning the shine to the stone was a chance they were willing to take. The team began cleaning the floor, and then they proceeded to work on the rust stains. To remove the stains, they honed and polished the stone using RSR-2000, a poultice designed to eliminate rust stains from common natural stones quickly. After treating, honing, and polishing the floor, the result was that rich, glossy sheen that the homeowner fell in love with at the beginning. To give it a final touch and to protect the stone from further damage, the team applied Tile Armor, a waterborne sealant that preserves the stone, preventing dirt penetration and stains while making it easier to clean. After finishing the job, some deep stains remained. Despite that, the stone was brought back to its former glory, and the client just loved it! Our job wasn't finished just yet; we would not leave without giving the homeowner some recommendations to maintain the stone. To keep the marble floor looking like the finished product, Sir Grout Denver recommended the use of pH-neutral and soap-less cleaners. Acid-based cleaners will cause marble floors to become etched and dull. If your marble floor has orange rust stains that resemble the ones in the "before" photo above, don't let the situation get worse. Orange rust stains can devalue your luxurious white marble floor. Call (303) 542-0888 for a free evaluation – today!